Semarang | Unimus (13/02/2019) To improve students achievement, a University should facilitate and provide them with sufficient knowledge. Students are demanded to be excellent not only in academic or cognitive competence, but also in their interest and talent. Students with achievement in particular institution could be the additive value and be the good media to promote university’s reputation. To realise it, Unimus facilitate “Mahasiswa Berprestasi” selection and organise Workhop entitled “Sinematografi dan Penulisan Karya Ilmiah Bagi Mahasiswa”. It was held on Wednesday, 13 February 2019 in NRC Building of Unimus. 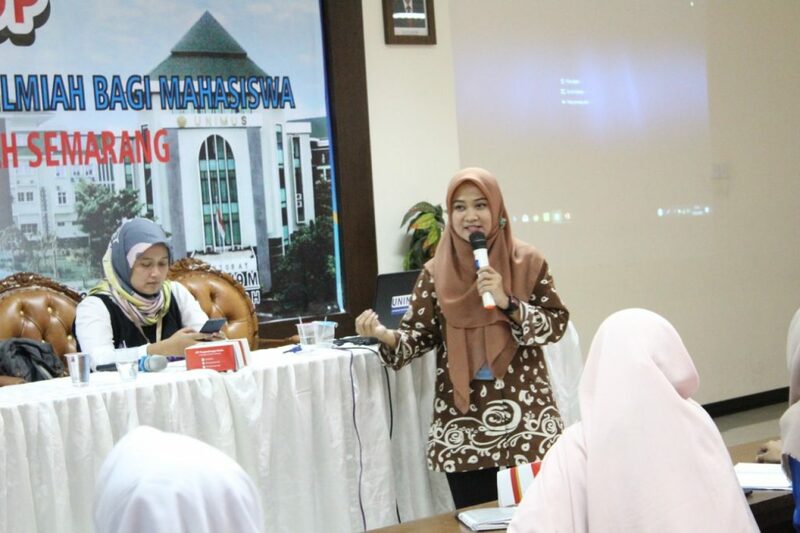 The chairperson of Bureau of Academic and Students Affairs (BAAK), Rosita Lihasari, S.Sos, M.Si aimed to improve and develop students’ potential in all study programs existing in Unimus. This workshop also aimed to facilitate students with sufficient knowledge to participate in Mawapres selection in university level. This event was opened by Vice Rector III, Dr. Samsudi Raharjo, M.M., M.T., and participated by at least 83 students from 20 study programs in Unimus. There were three speakers in this event such as chairperson of Community Service and Intellectual Property Rights (HaKI) of Unimus, Dr. Siti Aminah, S.TP., M.Si. explained about material entitled “Penulisan Artikel yang Benar dan Sesuai dengan Aturan Yang Berlaku Di LLDIKTI Di Wilayah VI”. 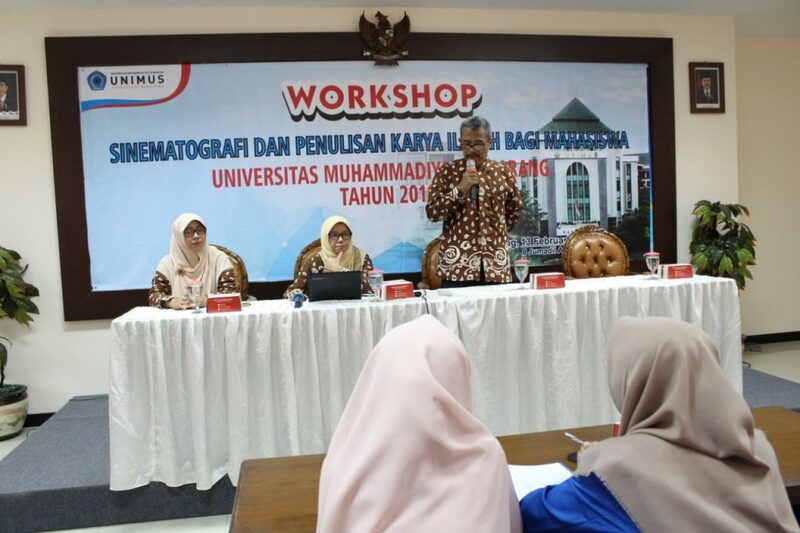 While the second speaker, Head of Study Program of English Education Department of Unimus, Muhimatul Ifadah, M.Pd elaborated how to express or present article well in order to make evaluator understand better. In addition, material about cinematography was delivered by staff of Public Relation and Protocol of Unimus, Anggry Windasari, S.Ikom who shared about tips and tricks of taking picture or video with good angle to produce informative and attractive result. Vice Rector III in his welcoming speech affirmed that mawapres selection and workshop can simply be the media of sharing the information to improve students’ achievement. “This selection was begun from the study program up to university level. Then, the winner of mawapres in university level will be sent off to join regional selection (Central Java level) through LLDIKTI regional VI” he elaborated. “Through this activity, students are expected to apply their knowledge and theory in the future. Besides, students will get invaluable experience”, he added. By joining this workshop, participants got many material about how to write good article and how to perform it attractively so it will impress the evaluator. In addition, they will get enough information about how to take good pictures, video and profile video creatively. In conclusion, to be student with achievement (mawapres), it is not enough for students to count on their GPA but their participation in various organisation also become consideration.